Aside from Richard Petty, I'm pretty sure most race fans love to see women drivers. Auto racing is one of the few sports where there is no reason men and women are unable to compete equally. And while we are still in the infancy of any influx of women into racing, the popularity of current females like Danica! and The Fisher Queen leads one to think that there will be more/better "girl drivers" in the future. Unless of course, things go all haywire like they have in NASCAR. The New York Times has a story about a really nasty situation involving Erin Crocker, the only regularly employed woman in NASCAR. Crocker, 25, drives for Ray Evernham, 49, who after overseeing the early successes of Jeff Gordon went on to form a new racing team backed by Dodge. Evernham is the most prolific Dodge owner, and he has recently been involved in a legal dispute with driver Jeremy Mayfield after Evernham fired Mayfield. So what does Crocker have to do with Mayfield getting fired? Although Crocker drives in the Craftsman truck series while Mayfield is a Nextel Cup Series stock car driver, Mayfield claims he was fired because he didn't have didn't have adequate support to be a competitive driver. He said that lack of support was because Evernham - owner of both cars - was too preoccupied with a "personal relationship" with a "female driver", and there's only one female driver in NASCAR. Now, this is not just a NASCAR story and there are several reasons I bring up this whole sordid affair. First, it's widely known that Danica! cited Bobby Rahal's preoccupation with a decidedly different "personal relationship" (specifically, his son's driving career) as a reason for her exodus to Andretti Green. A team needs a leader, and if that leader is gone then people start using phrases like "inmates running the asylum" while conditions inevitably disintegrate. More importantly, this is exactly the kind of thing we should be worried about with more women in racing. You've probably seen it in your own office, those situations where the attractive women starts hanging around a bit too much with the boss and suddenly she's getting a promotion or preferential treatment. Sometimes it's the other way around gender-wise, but the story is the same. There is no reason to think individuals in racing would be any different because - suprise! - they are people too. So for all the additional sponsors and fans (and dollars) a women like Danica! can bring to a team, we now need to start thinking about the additional speculation and drama that could occur simply because of gender differences. I hope no one starts any rumors about her or The Fisher Queen, but I can't help but think at some point we will have to deal with this. One hug that is too tight or one smiling look that seems to last too long and the next thing you know people are talking, and talking is a distraction people don't need when dealing with machines traveling 220 miles per hour. 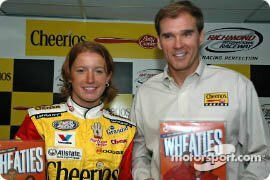 Since no one is denying the relationship, it has to be presumed that Evernham and Crocker are indeed closer than friends and I wish them well if they enjoy each other's company. I don't think the whole employee/employer relationship thing usually works out in the long term (just ask Monica Lewinski) but you never know. Regardless, from today forward they will forever be looked upon differently, especially Crocker who may have just shot down her budding career amid speculation she may have received preferential treatment for abilities other than driving. She may even have shot down other female NASCAR careers as well. The consequence is that now, just as we are basking in the glow of two women driving in the IRL race in Kentucky, skepticism may now be levied against women in all forms of racing. I would like to think that these women got there based on their driving abilities, and I will continue to believe this until I am shown any proof to the contrary. Unfortunately, the current rumor-driven news environment means that it probably won't be long before we start hearing hints or allegations of driver impropriety, distracting teams and disheartening fans. If that happens, then the fans' honeymoon with these drivers will be over before it had a chance to truly begin.